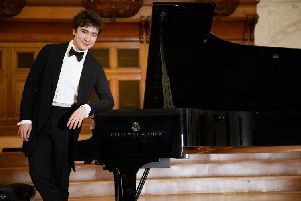 Award-winning composer and pianist Polo Piatti will be playing at Hastings Sinfonia’s Winter Warmers concert tomorrow (Saturday, January 31) at St John the Evangelist Church in Brittany Road, St Leonards from 7.30pm. He is known around the world for his beautifully tuneful classical music and the charismatic musician is the founder and artistic director of Hastings Sinfonia, as well as the arts and entertainment officer at the Winkle Club. The composition was conceived with Winston Churchill in mind, being one of the most prominent members of the famous club. Polo Piatti will be performing this soul-stirring piece together with Hastings Sinfonia tomorrow. A resident of Hastings old town, the British-Argentine composer was born in Buenos Aires where he started piano lessons at the age of three to become a successful concert pianist and classical improviser. Accepted with honors at the National Conservatoire in Argentina at the tender age of 12, he graduated with distinction. He continued his musical studies in Paris and Berlin and has worked since in both, the UK and abroad, not only as a composer but also as a very successful concert pianist, musical director and conductor. Visit www.polopiatti.com.